The PCSD eRepository is your online resource to documents, presentations and tools on policy coherence. Help us build this repository by uploading your own content or comment on existing material. The PCSD Partnership (#SDGAction12066) brings together governments, international organisations, civil society, think-tanks, the private sector and other stakeholders from all regions of the world committed and working to enhance policy coherence for sustainable development (SDG target 17.14) as a key means of SDG implementation. How does the PCSD Partnership work? Why is PCSD critical for SDG implementation? 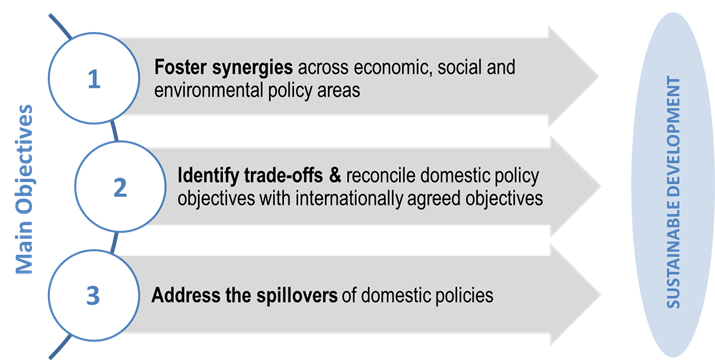 What is Policy Coherence for Sustainable Development? PCSD is an approach and policy tool to integrate the economic, social, environmental, and governance dimensions of sustainable development at all stages of domestic and international policy making. Note: This definition builds on and integrates the call for increased efforts at all levels to "enhance policy coherence for development (PCD)" associated with MDG 8 in the MDG Summit Outcome Document (para.41) through "mutually supportive and integrated policies across the economic, social and environmental issues for sustainable development [...] and policies consistent with the objectives of sustained, equitable and inclusive economic growth, poverty eradication and sustainable development".